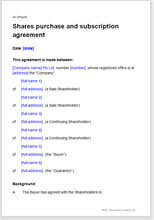 Shares purchase and subscription agreement for new shares. New shareholder subscribes for new holding but also buys some shares from other shareholders. To create majority or minority shareholding. Full buyer protection. Full version, options for extensive warranties by other shareholders. Option for claw-back against poor performance. Option for guarantor. Other document versions available. This is a comprehensive agreement for a new human or corporate shareholder both to buy shares from one or more shareholders and to subscribe for new shares to create a minority or majority holding of shares in a private company. The company may be in any industry and of any size. We assume you are the buyer. The deal is that you pay cash but hold back an agreed sum until after the next set of accounts. If the profit is not as promised, you can then deduct from your payment of the balance, a sum calculated by a simple pre-agreed formula. You may also make a loan to the company, though this is covered in a separate document and merely referenced here. This document provides the same protection to you as you would expect if you were buying the whole company. You have the benefit of 127 warranties (less what you decide to edit out). The penalty reduction of balance due by you is calculated by reference to a simple, flexible formula. There is an option for one of the selling shareholders to be a trustee (as a trustee, he cannot give warranties). This document enables you to decide how tough you want to be and who you want to bind. As drawn, the document binds all the shareholders to the warranties, but you could decide that only shareholder-directors should be at risk. warranties protect the interest of the buyer-subscriber, who does not have the information available to the other shareholders. It is fair and reasonable for a buyer to demand warranties and for shareholder-directors to give them. However, it is quite easy for a buyer to use warranties to “improve” his original deal. So, if you are a shareholder . . . . do not give a warranty if you do not know whether it is true, but do be prepared to “go and find out” information that could be within your knowledge. warranties sounds an awful lot. Do you really need them? Will you understand them? Net Lawman advises: probably not and absolutely yes! Our warranties are written in plain English. A seller should start with a full set unless he is sure he knows everything there is to know about his proposed acquisition. When you read the warranties, you will understand how important they are. The framework of the deal is the Companies Act 2008. Within that framework, there are no special requirements as to what your deal should be. Net Lawman sells similar versions of this document, assuming alternative deals. You can assess all of them at Share sale and purchase agreements. "Very useful and practical for start-ups and entrepreneurs."